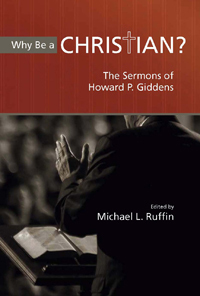 For generations of Georgia Baptists, Howard P. Giddens is a beloved and respected pastor, teacher, and denominational leader. His active service spanned the last six decades of the twentieth century; but even in “retirement” his influence continues unabated. A graduate of Mercer University and the Southern Baptist Theological Seminary, he served as pastor of three Georgia Baptist churches and then as professor of Christianity at Mercer. He was the epitome of the scholar/pastor. These sermons, which cover such subjects as Jesus Christ, the Christian life, holy days, the family, evangelism, and missions, reverberate with a deep love for the Lord, for the Church, for the Bible, and for people. The book will be a treasure to those who had the privilege of being parishioners or students of Dr. Giddens. It will also serve in several ways as a valuable resource to students and practitioners of preaching. First, it offers one of the finest examples available of a “classical” preaching style that was practiced in the mid-twentieth century. Second, it shows how careful scholarship, deep piety, warm-hearted compassion, and prophetic challenge can be combined in a sermon. Third, it contains material that will offer stimulus and inspiration for the crafting of sermons today. These sermons inspire, teach, and convict. These are the words of a man who has made a difference in thousands of lives.